Sphingolipids are abundant membrane components and important signaling molecules in eukaryotic cells. Their levels and localization are tightly regulated. However, the mechanisms underlying this regulation remain largely unknown. In this study, we identify the Golgi-associated retrograde protein (GARP) complex, which functions in endosome-to-Golgi retrograde vesicular transport, as a critical player in sphingolipid homeostasis. GARP deficiency leads to accumulation of sphingolipid synthesis intermediates, changes in sterol distribution, and lysosomal dysfunction. A GARP complex mutation analogous to a VPS53 allele causing progressive cerebello-cerebral atrophy type 2 (PCCA2) in humans exhibits similar, albeit weaker, phenotypes in yeast, providing mechanistic insights into disease pathogenesis. Inhibition of the first step of de novo sphingolipid synthesis is sufficient to mitigate many of the phenotypes of GARP-deficient yeast or mammalian cells. Together, these data show that GARP is essential for cellular sphingolipid homeostasis and suggest a therapeutic strategy for the treatment of PCCA2. Every cell is enveloped by a membrane that forms a barrier between the cell and its environment. This membrane contains fat molecules called ‘sphingolipids’, which help to maintain the structure of the membrane and enable it to work correctly. These molecules are also used as signals to send information around the interior of the cell and are required for the cell to grow and divide normally. The levels of sphingolipids in the membrane have to be tightly controlled because any imbalance can cause stress to the cell and can lead to serious diseases. Sphingolipids are made inside the cell and are then sent to a compartment called the Golgi before being delivered to the membrane. To regulate the amount of sphingolipids in the membrane, these molecules are routinely returned to the interior of the cell in small structures called endosomes. From here, they can either be broken down or recycled back to the membrane via the Golgi. A group of proteins known as the Golgi-associated retrograde protein complex (or GARP) is involved in the movement of endosomes from the membrane to the Golgi. People that have a mutation in the gene that encodes GARP suffer from a severe neurodegenerative disease known as ‘progressive cerebello-cerebral atrophy type 2’ (PCCA2) in which brain cells die prematurely. Researchers have assumed that the most important role of GARP is to sort proteins, and that the missorting of proteins leads to PCCA2. Here, Frohlich et al. used a combination of genetic analysis and biochemical techniques to study GARP in yeast cells. The experiments show that GARP is critical for sphingolipid recycling, and that a lack of GARP leads to more sphingolipids being degraded, which results in a build-up of toxic molecules. Frohlich et al. generated yeast cells that have the same mutations in the gene that encodes GARP as those in human patients with PCCA2. These cells grew much slower than normal yeast and were less able to transport sphingolipids from the endosome to the Golgi. Like the yeast cells, human cells in which the gene that encodes GARP was less active also accumulated toxic molecules. Together, these findings suggest that a build-up of toxic fat molecules may be responsible for the symptoms observed in PCCA2 patients. A future challenge is to find out whether this also applies to patients with Alzheimer's disease and other conditions that also affect endosomes. Eukaryotic membranes are composed of a complex mixture of lipids belonging to three major classes: sphingolipids, sterols, and glycerophospholipids. The lipid composition of membranes is tightly regulated to achieve homeostasis. Several mechanisms control intracellular levels of glycerophospholipids (Loewen et al., 2004; Martin et al., 2007) and sterols (Brown and Goldstein, 1999; Sever et al., 2003; Hampton and Garza, 2009). How cells maintain appropriate sphingolipid levels, however, is much less understood. Sphingolipids make up between 10 and 20% of the mammalian plasma membrane (van Meer et al., 2008). They are generated in the ER and Golgi and are subsequently delivered to the plasma membrane by vesicular transport (Klemm et al., 2009). Sphingolipids at the plasma membrane are internalized by endocytosis and delivered to the lysosome for catabolism. Sphingolipids can also be recycled from endocytic vesicles back to the plasma membrane via the Golgi apparatus (Choudhury et al., 2002). Maintenance of membrane sphingolipid levels is important to ensure plasma membrane integrity and to facilitate normal membrane trafficking at the Golgi apparatus and throughout the endocytic pathway (Trajkovic et al., 2008; Klemm et al., 2009; Shen et al., 2014). In addition, intermediates of sphingolipid synthesis, including ceramide and sphingosine-1-phosphate, are important signaling molecules that mediate cell proliferation, differentiation, and death (Hannun and Obeid, 2008; Maceyka and Spiegel, 2014; Montefusco et al., 2014). How cells achieve sphingolipid homeostasis in membranes remains unclear. However, recent studies have shed some light on this process. In yeast, a reduction in plasma membrane sphingolipid levels results in activation of the Ypk1/2 kinases through the TORC2-signaling cascade (Roelants et al., 2011; Berchtold et al., 2012). Substrates of these kinases, the ER-localized Orm1/2 proteins, are negative regulators of serine-palmitoyl transferase (SPT), an enzyme that catalyzes the first and rate-limiting step of sphingolipid synthesis (Breslow et al., 2010). The phosphorylation of Orm1/2 releases these proteins from SPT, thereby initiating sphingolipid synthesis and the generation of the early synthesis intermediates, long-chain bases. In addition, Ypk1/2 kinases phosphorylate key subunits of the sphingolipid metabolic enzyme ceramide synthase, increasing its activity and flux of more distal steps of sphingolipid biosynthesis (Muir et al., 2014). The physiological importance of sphingolipid homeostasis is underscored by the links of sphingolipid imbalances to disease. For instance, a number of lysosomal storage diseases, such as Niemann–Pick type C or Gaucher's disease, result from lysosomal accumulation of different sphingolipid species (Platt, 2014). These diseases preferentially affect the central nervous system (Platt, 2014) suggesting that sphingolipid imbalance can lead to neurotoxicity. There are few effective treatments. Therefore, a more complete understanding of sphingolipids is needed and is of significant biomedical importance. Here, we use a chemical genetics screen to uncover an important role of retrograde endosome-to-Golgi trafficking in maintaining cellular sphingolipid homeostasis. We discover a critical role of the Golgi-associated retrograde protein (GARP) complex in sphingolipid homeostasis, and we provide mechanistic insight into a human mutation in this complex that causes the early-onset neurodegenerative disease progressive cerebello-cerebral atrophy type 2 (PCCA2) (Feinstein et al., 2014). 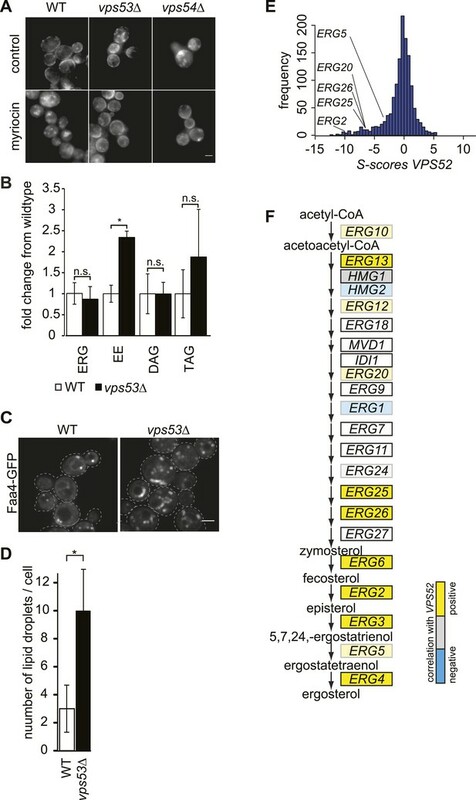 Remarkably, we find that inhibition of sphingolipid synthesis is sufficient to restore crucial aspects of membrane homeostasis when retrograde trafficking via the GARP complex is defective. To identify genes involved in the regulation of sphingolipid homeostasis, we performed a quantitative, genome-wide screen in yeast for modulators of a growth defect caused by myriocin, an inhibitor of SPT, which catalyzes the first and rate-limiting step of sphingolipid synthesis (Miyake et al., 1995). Of 5500 yeast strains analyzed, 703 showed a significant interaction with myriocin (p < 0.05), including 326 that suppressed and 377 that exacerbated the growth defect (Figure 1A and Supplementary file 3). A chemical biology screen reveals the retrograde endosome to Golgi trafficking machinery as a key regulator of sphingolipid homeostasis. (A) A chemical genetic screen for interactions with myriocin. Calculated T-scores are plotted against colony size on control plates. Genes are color-coded according to their significance score. Red p < 0.001, orange p < 0.01, light blue p < 0.05, blue p > 0.05. (B) A model for retromer- and Golgi-associated retrograde protein (GARP)-mediated retrograde endosome-to-Golgi trafficking. Subunits of the GARP complex and retromer identified in our screen are denoted. Genes are color coded according to their T-score. (C) Depletion of sphingolipids suppresses the growth defect of yeast strains harboring GARP mutations. Wild-type cells and vps51Δ, vps52Δ, vps53Δ, and vps54Δ mutant cells were spotted on control plates and plates containing increasing concentrations of myriocin, as indicated. One of the strongest class of suppressors identified in the screen (p < 10−7) contained factors mediating retrograde trafficking from endosomes to the Golgi (Figure 1—figure supplement 1). This included mutants in each subunit of the GARP complex (vps51Δ, vps52Δ, vps53Δ, and vps54Δ) and in four of five subunits of retromer (vps17Δ, pep8Δ, vps35Δ, vps29Δ; Figure 1B). In addition, our screen identified two of the three SNARE proteins important for GARP-dependent trafficking (tlg2Δ, vti1DAMP) and VPS63, a gene overlapping almost completely with the GTPase YPT6 that is involved in Golgi-endosomal trafficking. Consistent with a function of Ypt6 maintaining sphingolipid homeostasis, deletion of one subunit of its guanine nucleotide exchange factor, RIC1, suppressed the growth defect caused by sphingolipid biosynthesis inhibition. However, YPT6 had no significant phenotype in our screen. Similarly IMH1, encoding a protein important for retrograde transport from endosomes to the Golgi had no phenotype (Supplementary file 3). This could indicate that YPT6 and IMH1 are false negatives in our screen (e.g., due to problems of library yeast strains) or indicate they are less critical when sphingolipid synthesis is inhibited. In contrast to phenotypes for genes encoding GARP subunits, the disruption of genes involved in related vesicular trafficking machinery, such as the COG or TRAPP complexes(Whyte and Munro, 2002; Sacher et al., 2008), resulted in little change in growth when sphingolipid synthesis was impaired by myriocin treatment (Figure 1—figure supplement 1; Supplementary file 4). To validate these results, we spotted GARP complex mutants and control strains on plates containing myriocin. The growth defects in yeast cells harboring GARP mutations were suppressed by myriocin, whereas wild-type cell growth remained impaired (Figure 1C). We hypothesized that the deficiency of the GARP complex may result in the accumulation of a toxic sphingolipid intermediate that is reduced by myriocin treatment. To identify which lipids might contribute to this toxicity, we inhibited key steps of sphingolipid synthesis and examined their effect on cell growth (for an overview see Figure 2—figure supplement 1). In contrast to myriocin treatment, the inhibition of downstream steps of sphingolipid synthesis, such as those catalyzed by Aur1, an inositolphosphorylceramide synthase, or ceramide synthase, by using aureobasidin A (Nagiec et al., 1997) and fumonisin B1(Wu et al., 1995), respectively, strongly inhibited the growth of yeast harboring GARP mutations (Figure 2A,B). This suggests that vps53Δ cells accumulate a toxic intermediate upstream ceramide synthase and may not have adequate levels of the downstream products. The disruption of the GARP complex leads to the accumulation of early sphingolipid synthesis intermediates. (A, B, C) Blocking early steps of sphingolipid synthesis exacerbates GARP-associated growth defects. (A) GARP mutants are sensitive to IPC synthase inhibition. Wild-type, vps51Δ, vps52Δ, vps53Δ, and vps54Δ cells were spotted on control plates and plates containing 0.05 μM aureobasidin A. (B) GARP mutants are sensitive to ceramide synthase inhibition. Wild-type, vps51Δ, vps52Δ, vps53Δ, and vps54Δ cells were spotted on control plates and plates containing 100 μM fumonisin B1. (C) VPS53 mutants are sensitive to overexpression of the alkaline ceramidase Ypc1. Wild-type or vps53Δ cells harboring an empty plasmid or a plasmid encoding YPC1 under control of the GAL10 promoter were spotted on glucose- or galactose-containing plates. (D) GARP mutants are sensitive to high levels of long-chain bases, early sphingolipid intermediates. Wild-type, vps53Δ, and vps54Δ cells were spotted on control plates or plates containing 30 μM phytosphingosine (PHS). (E) GARP complex deficiency results in an accumulation of long-chain bases. The lipidomic analysis of sphingolipids from vps53Δ (black) compared with wild-type strains (white) is shown. LCB = long chain base; CER = ceramide; IPC = inositolphosphorylceramide; MIPC = mannosylinositolphosphorylceramide; M(IP)2C = mannose-(inositol-P)2-ceramide. *p < 0.05; n.s. not significant (F, G) Long-chain bases in GARP mutants are reduced upon myriocin treatment but remain elevated. The levels of (F) dihydrosphingosine (DHS) and (G) PHS from wild-type (white bars), vps52Δ (light gray bars), vps53Δ (dark gray bars), and vps54Δ cells (black bars) to myriocin treatment is plotted as fold change from wild-type. *p < 0.05; n.s. not significant (H) Orm1/2 proteins are hyperphosphorylated in vps53Δ mutants. Orm1-HA expressing wild-type or vps53Δ cells were analyzed by Western blotting against the HA tag or PGK1 as control. Wild-type cells were treated with 5 μM myriocin as indicated. Treatment of the cell lysates with λ-phosphatase as indicated. Consistent with this hypothesis, vps53Δ cells but not wild-type cells overexpressing the alkaline ceramidase Ypc1, which is predicted to deplete ceramides and as a consequence downstream sphingolipids showed almost no detectable growth (Figure 2C). Also consistent with the hypothesis, vps53Δ and vps54Δ cells, but not wild type cells, were highly sensitive to addition of the upstream sphingolipid synthesis intermediate phytosphingosine (PHS) (Figure 2D). To directly assess whether upstream sphingolipid intermediates accumulate in GARP complex-deficient cells, we analyzed cellular lipids by mass spectrometry. Strikingly, vps53Δ cells showed an eightfold increase in levels of total long-chain bases compared with wild-type controls (Figure 2E). Among the different long-chain base species, dihydrosphingosine (DHS) increased ∼tenfold and PHS increased ∼threefold (Figure 2F,G). In addition, vps53Δ cells had a ∼twofold reduction of the complex sphingolipid M(IP)2C (Figure 2E); the levels of IPC, MIPC, and ceramides were unchanged. Based on the current model of sphingolipid synthesis regulation, we expect that reduction of the complex sphingolipid M(IP)2C in vps53Δ cells may activate the upstream sphingolipid synthesis enzyme SPT by releasing Orm1/2 inhibition, thereby exacerbating the GARP mutant phenotype. Consistent with this model, we found that Orm1 was hyperphosphorylated in vps53Δ cells compared with controls (Figure 2H). Together, these results suggest that blocking the GARP-mediated recycling of lipids to the plasma membrane leads to a toxic build-up of long-chain bases, possibly due to a higher rate of degradation of complex sphingolipids in the vacuole and increased biosynthesis. We therefore reasoned that myriocin treatment reduces this toxicity by lowering the levels of long-chain bases. To evaluate this possibility, we determined the levels of long-chain bases before and after myriocin treatment in vps52Δ, vps53Δ, vps54Δ, and control cells. Importantly, myriocin treatment greatly reduced the accumulation of long-chain bases in each of the GARP mutants (Figure 2F,G). 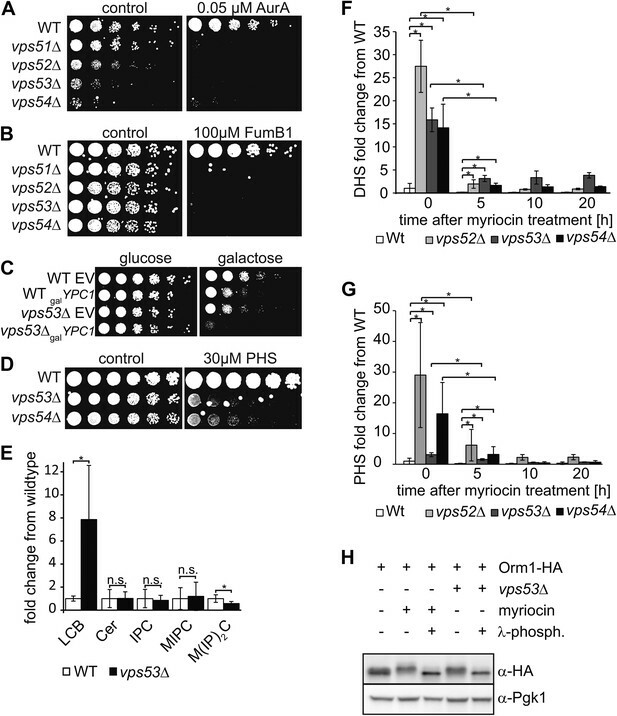 The rate of long-chain base decrease during the myriocin treatment time course was similar in wild-type and vps53Δ cells (Figure 2—figure supplement 2), arguing that myriocin is equally effective in reducing sphingolipid synthesis in either strain. However, even after prolonged, DHS levels remained elevated compared with untreated control cells, suggesting the pool of long-chain bases turns over more slowly (Figure 2F). We reasoned that complex sphingolipids fail to be recycled to the plasma membrane in GARP mutants and are instead rerouted for degradation in vacuoles causing accumulation of long-chain bases and triggering lipotoxicity. A prediction from this hypothesis is that vps53Δ and wild-type cells would distribute exogenously added, fluorescently labeled sphingosine (NBD-sphingosine) differently. Testing this possibility, we found that added NBD-sphingosine and FM4-64, a marker of endocytic membranes both initially label the plasma membrane, but then segregate into different compartments in wild-type cells: as expected, after 60 min, FM4-64 stained the yeast vacuole, whereas the NBD-sphingosine signal localized in one or a few foci likely representing compartments of the endosomal/secretory pathway (Figure 3A, top control panels). In vps53Δ cells, however, both lipids co-localized after 60 min in what appeared to be highly fragmented vacuoles (Conboy and Cyert, 2000; Conibear and Stevens, 2000) (Figure 3A middle control panels). Intriguingly, the abnormal vacuolar morphology in vps53Δ cells was partially rescued by 12-hr myriocin treatment, resulting in a few small vacuoles (Figure 3A bottom-myrocin, 3B, 3C, and Figure 3—figure supplement 1 for characterization of vacuolar classes). However, NBD-sphingosine still localized to the vacuoles in myriocin-treated vps53Δ cells, not to the plasma membrane as in wild-type cells (Figure 3A). Together, these results suggest that exogenously added long-chain bases are maintained to a large degree in the endosomal/secretory pathway of wild-type cells, but accumulate in the vacuole of GARP mutants. The data also suggest that myriocin treatment of these cells does not restore proper endosome to Golgi recycling of sphingolipids, but partially rescues vacuolar dysfunction, as indicated by restoration of vacuole morphology. GARP mutants show altered vacuolar morphology and function. (A) Sphingolipid recycling remains blocked upon myriocin treatment and sphingolipids accumulate in vacuoles. Wild-type cells (top panels), wild-type cells treated with myriocin (1 μM, 12hr), vps53Δ cells, or vps53Δ cells treated with myriocin (1 μM, 12hr). NBD-sphingosine, green. Vacuoles (FM4-64), red. Representative images are shown. Scale bar = 2.5 μm. (B, C) Inhibition of sphingolipid biosynthesis partially restores vacuolar morphology in GARP mutants. (B) Quantification of the vacuolar phenotypes in vps53Δ mutants, mock treated or treated with myriocin is shown (Classification, see Supplementary figure 2). (C) Thin-section EM analysis of high-pressure frozen wild-type or vps53Δ cells mock-treated (left panels) or treated with myriocin (12hr, 1 μM; right panels). Representative images are shown. N = nucleus; V = vacuole; LD = lipid droplet. White arrows indicate fragmented vacuoles. Scale bars = 1 μM (D). Three targets of zinc transcription factor Zap1 are down regulated in the GARP mutant vps53Δ. A proteomic analysis of vps53Δ and wild-type cells is shown. Protein intensities are plotted against light/heavy SILAC ratios. Significant outliers are colored in red (P < 1−11), orange (P < 1−4), or light blue (p < 0.05); other proteins are shown in dark blue. E) GARP mutant zinc sensitivity is rescued by myriocin treatment. Wild-type and vps53Δ cells were spotted on control plates or plates containing 1 μM myriocin, 4 mM zinc or 1 μM myriocin and 4 mM zinc. To further understand the physiological impact of trafficking defects caused by GARP complex deficiency, we analyzed the protein composition of vps53Δ mutant cells by mass spectrometry-based proteomics. Among the 3347 proteins analyzed, we found that the levels of three proteins under control of the zinc-dependent transcription factor Zap1 (Lyons et al., 2000) were strongly decreased (Adh4, Zrt1, Zps1; P < 1e−11; Figure 3D). 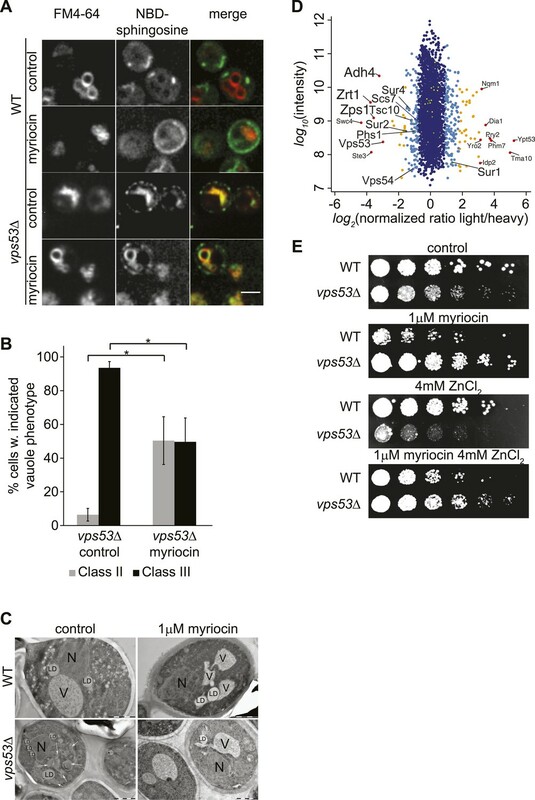 Since the yeast vacuole is the main storage organelle for intracellular zinc (Simm et al., 2007), we hypothesized that the altered vacuolar morphology of vps53Δ mutants results in increased zinc release from the vacuole contributing to toxicity. Consistent with previous studies (Banuelos et al., 2010), we found that increased levels of zinc exacerbated the growth defect of vps53Δ mutants. Importantly, this sensitivity is completely suppressed by myriocin treatment (Figure 3E). Our proteomic studies also detected significantly (p < 0.05) decreased levels of several ER-resident, early sphingolipid metabolic enzymes, such as Tsc10, Sur2, Sur4, or Phs1, potentially indicating regulatory adaptations to high levels of intracellular long-chain bases (Figure 3D). Sphingolipids and sterols interact in the plasma membrane and are both internalized by endocytosis, suggesting that their levels might be coordinately regulated (Simons and Vaz, 2004; Jacquier and Schneiter, 2012). We therefore reasoned that sphingolipid imbalance due to GARP deficiency could also lead to sterol accumulation or altered cellular distribution. Indeed, filipin, a dye that binds sterols, accumulated in internal structures of vps53Δ and vps54Δ cells (Figure 4A). Inhibition of sphingolipid synthesis by myriocin in GARP mutants was sufficient to reverse sterol accumulation, as detected by filipin staining. In contrast, wild-type cells accumulated filipin-positive structures during myriocin treatment. This finding is consistent with the sterol accumulation phenotype of the temperature sensitive SPT mutant lcb1-100 (Baumann et al., 2005). The disruption of the GARP complex alters sterol distribution in yeast. (A) Intracellular sterols accumulate in the GARP mutants vps53Δ and vps54Δ. Wild-type (left panels), vps53Δ cells (middle panels), and vps54Δ cell (right panels) treated with methanol (top panels) or myriocin (lower panels) were stained with filipin and analyzed by epifluorescence microscopy. Representative images are shown. Scale bar = 2.5 μm. (B) Neutral lipids accumulate in the GARP mutant vps53Δ. Lipidomic analysis of neutral lipids isolated from vps53Δ (black) expressed in fold change from the wild-type (white). ERG = ergosterol; EE = ergosterol ester; DAG = diacylglycerol, TAG = triacylglycerol. *p < 0.005; n.s. not significant. (C, D) Lipid droplets accumulate in the GARP mutant vps53Δ. Lipid droplets marked by Faa4-GFP. (C) Representative confocal midsections of wild-type (left) or vps53Δ cells are shown. Scale bar = 2.5 μm. (D) Quantification of (C). The number of lipid droplets per cell compared to wild-type cells (white bar) is shown. n = 100 cells. *p < 0.001; n.s. not significant (E) Components of the GARP complex genetically interact with sterol synthesis genes. Histogram of S-scores for VPS52 extracted from an EMAP (Hoppins et al., 2011) is shown. (F) Model of ergosterol metabolism. Genes are color-coded according to correlation coefficient with the GARP subunit VPS52. Positive-correlated genes are indicated in yellow; anti-correlated genes are indicated in blue. Lipidomic analyses showed no significant change in cellular ergosterol levels in vps53Δ cells. However, we detected a two to threefold increase in ergosterol esters in these cells, suggesting that neutral lipids accumulate due to GARP complex deficiency (Figure 4B). Consistent with this, vps53Δ mutants showed a threefold increase in lipid droplets per cell, as identified by the LD marker protein Faa4, compared with wild-type cells (Figure 4C,D). To further explore the role of GARP in maintaining sterol homeostasis, we analyzed genetic interaction data (Hoppins et al., 2011) of vps52Δ and found synthetic growth defects with mutations in several genes encoding enzymes of ergosterol biosynthesis (ERG2, ERG20, ERG25, ERG26) (Figure 4E). Tetrad analyses of vps53Δ erg3Δ double mutants confirmed these synthetic growth defects (Figure 4—figure supplement 1). In addition, VPS52 showed positive correlations with many genes in ergosterol metabolism (ERG3, ERG25, ERG26, ERG6, ERG2, and ERG4; Figure 4F), further suggesting a role in maintaining intracellular sterol levels. Together, these results suggest that the GARP complex may help manage sterol levels in cells by recycling them from endosomes to the plasma membrane via the Golgi apparatus. Compound heterozygous mutations of human VPS53 were reported recently to cause the neurodegenerative disease PCCA2 (Feinstein et al., 2014). In these patients, one Vps53 allele abolishes protein expression, and the second is a missense mutation (Q695R) in the highly conserved C-terminus of VPS53. To understand the molecular consequences of the latter mutation, we generated a yeast strain harboring an analogous mutation, Q624R, and investigated its effects on lipid homeostasis, retrograde trafficking of proteins between endosomes and the Golgi, and vacuolar morphology. Similar to vps53Δ cells, cells harboring the Q624R mutation were resistant to myriocin treatment (Figure 5A). However, growth in the mutant was more impaired than in vps53Δ cells, suggesting a partial loss of GARP function in vps53 Q624R cells. Subsequent proteomic analyses revealed that the vps53 Q624R mutant protein is expressed at similar levels as the wild-type protein, indicating that this effect is due to its impaired activity, not its instability (Figure 5—figure supplement 1). A PCCA2-causing GARP complex mutation is a partial loss of function allele. 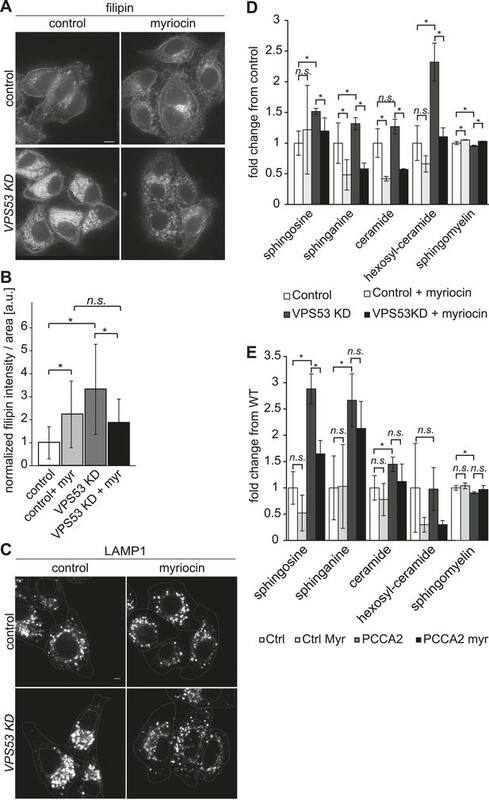 (A) A mutation analogous to the VPS53 allele causing progressive cerebello-cerebral atrophy type 2 (PCCA2) in humans is partially resistant to sphingolipid biosynthesis inhibition induced by myriocin. Wild-type cells harboring an empty plasmid and vps53Δ cells harboring an empty plasmid, a plasmid expressing Vps53, or a plasmid expressing the mutant vps53 Q624R were spotted on myriocin-containing (right) plates or control plates containing methanol (left) (B) Endosome-Golgi trafficking is partially impaired in yeast cells expressing the analogous PCCA2-causing mutation vps53 Q624R. The GFP-tagged CPY receptor Vps10-GFP (top panels left and right) was co-expressed with either Sec7-tomato (Sec7-tom; middle left panels) or Vps17-tomato (Vps17-tom; middle right panels) in wild-type and vps53 Q624R mutant cells. Representative confocal midsections are shown; scale bar, 2.5 µm. (C) The CPY receptor Vps10 accumulates in vps53 Q624R endosomes. Quantification of the distribution of Vps10-GFP between the Sec7-decorated Golgi (white bars) and retromer-decorated endosomes (black bars) in wild-type and vps53 Q624R cells. *p < 0.005; n.s. not significant. (D) Mutations in the GARP complex cause vacuolar fragmentation. Maximum projections of vacuoles marked with RFPmars-tagged V-ATPase subunit Vma1 (left panels) and the GFP-tagged CPY sorting receptor Vps10 (middle panels) in vps53Δ cells harboring a plasmid expressing Vps53 (top panels), an empty plasmid (middle panels) or a plasmid expressing a vps53 Q624R mutant (lower panels) are shown; scale bar = 2.5 µm. (E) Quantification of (D). Cells with class I (white bars), class II (gray bars), and class III (black bars) vacuoles were counted and plotted as percentage of the total number. n = 50. *p < 0.005; n.s. not significant. For phenotypic classification, see Figure 3—figure supplement 1. To evaluate whether endosome-to-Golgi trafficking is also compromised in vps53 Q624R cells, we evaluated this process by assaying the localization of Vps10, the sorting receptor for the vacuolar protease carboxypeptidase Y (Chi et al., 2014). In this assay, a green fluorescent protein (GFP)-tagged form of Vps10 is retrieved from endosomes to the Golgi apparatus by retrograde trafficking (Conibear and Stevens, 2000). We quantified co-localization of Vps10-GFP with the Golgi apparatus (marked with Sec7-tomato) or the endosome (marked by Vps17-tomato) (Figure 5B). Using this assay, we found that cells harboring a vps53 Q624R mutant allele had significantly reduced Vps10 levels in the Golgi apparatus (28%, compared with 43% in wild-type cells) and increased signal in the endosome (49%, compared with 24% in wild-type cells; Figure 5C), suggesting that retrograde trafficking is indeed impaired. 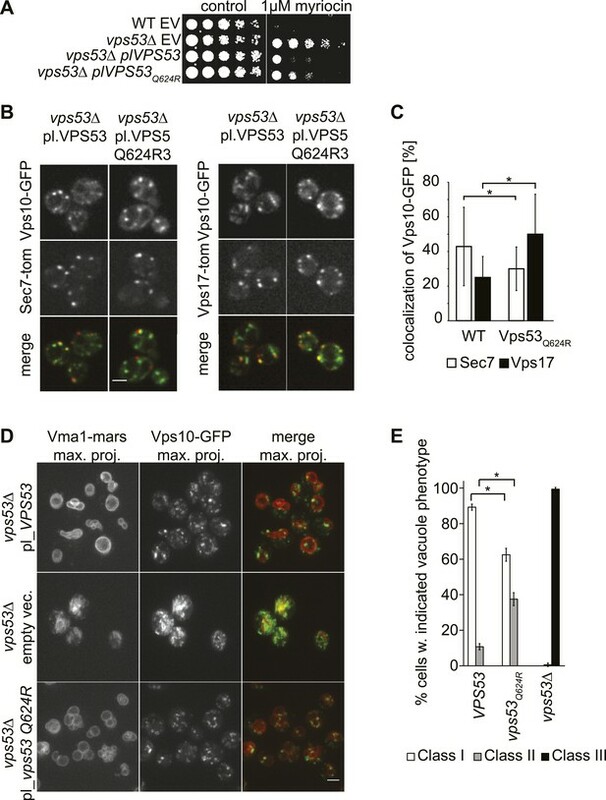 Also consistent with a partial loss of GARP function, vps53 Q624R mutant cells showed vacuolar fragmentation, highlighted by multiple small vacuoles in cells, which we found three times more frequently than in control cells (33% vs 11%, Figure 5D,E, Figure 3—figure supplement 1 for characterization of vacuolar classes). This intermediate phenotype appears to be similar to vacuoles in vps53Δ cells depleted for sphingolipids (Figure 3A) and is much weaker than in vps53Δ mutants in which all cells have highly fragmented vacuoles with no typical round structures apparent (Figure 5D,E). To determine whether GARP's function in sphingolipid homeostasis is conserved in mammals, we assessed the phenotype of HeLa cells depleted of the GARP complex. Similar to our findings in yeast, knock-down of the VPS53 GARP subunit caused accumulation of cholesterol in internal structures of HeLa cells, based on filipin staining (Figure 6A and (Perez-Victoria et al., 2010)). Notably, this accumulation was reduced dramatically by myriocin treatment, restoring filipin staining to levels similar to control cells treated with myriocin (Figure 6B). The depletion of sphingolipid levels reduced lysosome clustering and sterol accumulation due to GARP complex deficiency in HeLa cells. (A, B) Myriocin treatment reduced build-up of free cholesterol due to GARP complex deficiency. (A) Filipin staining of unesterified cholesterol in control (top panels) or Vps53 knock-down (lower panels) in HeLa cells treated with 1 μM myriocin for 12 hr (right panels) or DMSO as a control (left panels). Representative images are shown. Scale bar = 5 μm. (B) Quantification of the average free cholesterol filipin intensity/cell normalized to control cells. n = 32. *p < 0.0005; n.s. not significant. (C) Myriocin treatment partially restored intracellular distribution of lysosomes in the GARP KD. Control cells (top panels) or Vps53-KD cells (lower panels) were treated with 1 μM myriocin for 12 hr (right panels) or DMSO as a control (left panels) and stained with an antibody against the lysosomal protein LAMP-1. Representative confocal midsections are shown; scale bar = 2.5 μm. (D) Myriocin treatment reduced accumulations of early sphingolipid intermediates due to GARP complex deficiency. Lipidomic analysis of mock-treated HeLa control cells (white bars), myriocin-treated control cells (light gray bars), mock-treated VPS53 KD cells (dark gray bars), or myriocin-treated VPS53 KD cells (black bars) is shown. Levels are plotted as fold change from that of mock-treated control cells. Error bars represent the average of three independent experiments. *p < 0.05; n.s. not significant. (E) Lipidomic analysis of mock-treated control fibroblasts (white bars), myriocin-treated control fibroblasts (light gray bars), mock-treated PCCA2 patient fibroblasts (dark gray bars), or myriocin-treated PCCA2 patient fibroblasts (black bars) is shown. Levels are plotted as fold change from mock-treated control fibroblasts. Error bars represent the average of six independent experiments. *p < 0.05; n.s. not significant. GARP complex deficiency results in a defect in retrograde transport, leading to defects in lysosome morphology in HeLa cells (Perez-Victoria et al., 2008). We therefore reasoned that lysosome dysfunction could contribute to the toxicity caused by GARP deficiency. We confirmed that lysosomes appeared swollen and clustered in the juxtanuclear area of Vps53 knock-down cells, although LAMP1 protein levels were normal (Figure 6C, Figure 6—figure supplement 2). Importantly, myriocin treatment resulted in a more uniform lysosome distribution and partially reduced the size of LAMP-1 positive lysosomes in Vps53 knock-down cells (Figure 6C). In contrast, lysosome morphology in control cells was not appreciably affected. To test whether these defects could be caused by accumulation of sphingolipid metabolism intermediates, we isolated sphingolipids from myriocin- or mock-treated VPS53 knock-down and control cells and analyzed them by lipidomics. We found a ∼2.5 fold increase in hexosylceramide and a significant increase in the levels of sphingosine and sphinganine, as well as a decrease in sphingomyelin (Figure 6D and Figure 6—figure supplement 1). Importantly, myriocin treatment restored the levels of these sphingolipid intermediates in VPS53 knock-down cells (Figure 6D). To further evaluate the possibility that sphingolipid imbalances could, at least partially, contribute to development of PCCA2, we analyzed sphingolipid levels in fibroblasts from PCCA2 patients and controls. Similar to VPS53 knock-down in HeLa cells, PCCA2 fibroblasts exhibited increases in sphingosine, sphinganine, and ceramides compared with control fibroblasts. Similar to what was observed for VPS53 knock-down in HeLa cells, myriocin treatment reduced the accumulation of sphingolipid intermediates in PCCA2 fibroblasts to levels similar to those found in untreated control fibroblasts (Figure 6E). Here, we show that GARP complex-mediated retrograde trafficking from endosomes to the Golgi is important for cellular sphingolipid homeostasis. In yeast, loss of the GARP complex results in reduced levels of complex sphingolipids and the accumulation of sphingolipid synthesis intermediates, most notably long-chain bases. Importantly, this accumulation is correlated with abnormal vacuolar morphology and function, suggesting this build-up may be toxic. The depletion of a GARP complex subunit in mammalian cells results in similar phenotypes. Retrograde trafficking likely influences the subcellular localization of a large number of proteins. It is thus remarkable that many of phenotypes associated with GARP deficiency are greatly attenuated by pharmacological inhibition of SPT, the first and rate-limiting step in sphingolipid synthesis. Together, these results suggest that accumulation of toxic lipids may underlie a substantial degree of cellular dysfunction due to genetic defects in retrograde trafficking and that restoration of sphingolipid balance may be a strategy to treat diseases due to these defects. Our data suggest that the GARP complex is critical for recycling lipids between the plasma membrane, endosomes, and the Golgi apparatus. In both yeast and mammalian cells, GARP complex deficiency disrupted sphingolipid and sterol homeostasis and resulted in the accumulation of sterols in the endo-lysosomal system. Normally, lipids retrieved from the plasma membrane by endocytosis can be recycled via the retrograde endosome-to-Golgi pathway to supply lipids necessary for rapid membrane expansion during growth. In GARP mutants, however, some membrane-derived lipids appear to be rerouted to vacuoles (or lysosomes) for degradation. This rerouting of lipids likely reduces their levels in the plasma membrane and increases the levels of sphingolipids, and their break-down products, in the vacuole/lysosome. This reduction in membrane sphingolipids may explain GARP's apparent role in plasma membrane organization, reported previously in genome-wide visual screens (Grossmann et al., 2008; Frohlich et al., 2009). It is yet unclear whether sphingolipids and sterols follow bulk flow of membrane materials in the endocytic pathway or are preferably recycled by retromer and GARP complexes. Regardless, our data are most consistent with the hypothesis that in the absence of GARP, sphingolipids and sterols are rerouted to vacuoles/lysosomes. In lysosomes, sphingolipids are broken down by acid sphingomyelinase and ceramidase, likely contributing to the elevation in sphingoid bases. However, it is also possible that missorting of sphingolipid synthesis enzymes or trafficking proteins in GARP mutants contributes to the observed phenotypes. For instance, a protein important for the export of sphingolipid intermediates from lysosomes/vacuoles could be missorted in GARP mutants, thus increasing vacuolar sphingolipid accumulation. Several of our findings suggest that the accumulation of early sphingolipid synthesis intermediates due to GARP deficiency may result in cellular toxicity. We show that inhibition of SPT, which lowers long-chain bases in GARP mutants, suppresses the growth defect of these strains. In contrast, the inhibition of later steps of sphingolipid synthesis, for example, by blocking ceramide synthase or inositolphosphoryl ceramide synthase, does not lower long-chain base levels and increases toxicity in GARP mutants. In addition, treatment with the long-chain base PHS exacerbated this toxicity. In yeast, low levels of plasma membrane sphingolipids activate TORC2/Slm/Ypk signaling to phosphorylate the Orm-proteins, relieving their inhibition of SPT, increasing sphingolipid synthesis (Breslow et al., 2010; Han et al., 2010; Roelants et al., 2011; Berchtold et al., 2012). Consistent with a decrease of plasma membrane sphingolipids, we found that the Orm1/2 proteins are hyperphosphorylated in GARP mutants suggesting that de novo sphingolipid synthesis is also upregulated. This increase may exacerbate GARP deficiency-induced lipotoxicity due to increased production of these early synthesis intermediates. Why the accumulation of long-chain bases is toxic is currently unclear. One possibility is that long-chain bases possess detergent-like properties, especially in an acidic environment (Jimenez-Rojo et al., 2014), such as in the yeast vacuole. In model membranes, such as giant unilamellar vesicles, this detergent-like action leads to vesicular leakage (Contreras et al., 2006). This could explain the findings of marked vacuolar fragmentation and potential leakage of zinc from GARP-deficient yeast vacuoles. In support of this hypothesis, we found that inhibition of SPT and reduction of long-chain bases suppressed the zinc sensitivity in GARP mutants in yeast. Also consistent with this hypothesis, the accumulation of sphingolipid intermediates impairs ion homeostasis in mammalian lysosomes of a cellular Niemann–Pick type-C disease model (Lloyd-Evans et al., 2008). Alternatively, long-chain bases are known to inhibit glycerolipid synthesis (Wu et al., 1993), which might contribute to their cytotoxicity. Since sphingolipid and sterol levels are coordinated in membranes, it is not surprising that we also found that GARP deficiency alters sterol metabolism. Sphingolipids and sterols are thought to interact with each other in membranes. Thus, GARP deficiency likely results in missorting of both to the vacuole/lysosome. Our data are most consistent with a model where sphingolipids are degraded in the lysosome/vacuole leading to a toxic build-up of sphingolipid metabolites, whereas sterols are exported and stored in cytoplasmic lipid droplets as more inert fatty acid esters. Consistent with this, lowering sphingolipid levels by myriocin treatment of wild-type cells increases sterols stained by filipin. Possibly, this indicates that in the absence of sufficient sphingolipids, sterols that are not complexed with sphingolipids build-up and are stored in ester form. A surprising finding is that the accumulation of sterols in GARP mutants is suppressed by inhibiting sphingolipid synthesis. These data argue that in addition to sterol missorting in GARP mutants, accumulation of sphingolipid intermediates impairs normal sterol homeostasis, for example, by interfering with sterol export from the vacuole/lysosome or synthesis regulation. This further highlights that a primary cause for defects due to GARP deficiency may be lysosomal/vacuolar dysfunction due to sphingolipid accumulation. Consistent with our findings on sterol accumulation in GARP mutants, previous screens for lipid droplet phenotypes have identified mutations of several GARP subunit genes (VPS51, VPS53, and VPS54) to be associated with neutral lipid accumulation in LDs (Szymanski et al., 2007; Fei et al., 2008), suggesting that GARP deficiency could modulate sterol metabolism. In addition, mutations in the zebrafish homolog of Vps51, fat-free, result in an increased number of lipid droplets in the liver and intestine (Liu et al., 2010). Mutations in one component of the GARP complex, VPS53, cause PCCA2, a severe neurodegenerative disease characterized by profound mental retardation, progressive microcephaly, spasticity, and early-onset epilepsy (Feinstein et al., 2014). The autosomal disease, linked thus far to two PCCA2 alleles, the missense Q695R mutation, and a splice donor mutation, occurs predominantly in Jewish people of Moroccan ancestry. Our data show that one of these mutations, VPS53 Q695R, leads to defects in yeast that are similar to, albeit not as severe as, a Vps53 deletion. In addition, we show that sphingolipid intermediate levels are elevated in PCCA2 patient fibroblasts, which can be remedied by sphingolipid biosynthesis inhibition with myriocin. Thus, the pathogenesis of PCCA2 could be, at least partially, due to defects in lipid balance and storage. Interestingly, the disruption of the GARP subunit Vps54 in mice leads to a ‘wobbler’ phenotype, indicative of neurodegenerative disease sharing characteristics of ALS, including progressive motor degeneration and motor neuron loss (Perez-Victoria et al., 2010; Moser et al., 2013). Analyses of brain lipid profiles suggest sphingolipid intermediates and sterol esters accumulate in ALS patients (Cutler et al., 2002). In addition, mutations in the endo-lysosomal trafficking machinery have been implicated in neurodegenerative disorders including ALS and FTD (CHMP2B, FIG4, VAPB, and VCP) (Yang et al., 2001; Parkinson et al., 2006; Johnson et al., 2010; Maruyama et al., 2010) and defects in retrograde trafficking increase the risk for Parkinson's disease (VPS35) (Zimprich et al., 2011). Our data therefore suggest that lipid imbalance and toxicity due to impaired endo-lysosomal trafficking could be a common feature of this group of neurodegenerative diseases. Since inhibition of SPT reversed some aspects of cellular dysfunction in our studies, our findings suggest that inhibition of the initial step of sphingolipid synthesis may provide a useful therapeutic strategy to pursue in these diseases. All yeast strains used in this study are listed in Supplementary file 1. Standard yeast manipulations, including transformation, homologous recombination of PCR-generated fragments, and tetrad dissections, were performed as described previously (Berchtold and Walther, 2009). All plasmids used in this study were generated using methods previously described and are listed in Supplementary file 2. Yeast strains were grown according to standard procedures. Myriocin was added to liquid cultures at a final concentration of 1 µM. For spotting assays, myriocin, aureobasidin A, fumonisin B1, or PHS was added at concentrations as indicated and the plates incubated at 30°C for 36 hr. HeLa cells were cultured in Dulbecco's Modified Eagle Medium supplemented with 10% fetal bovine serum (FBS) and PenStrep (Gibco, Life Technologies, Carlsbad, CA). For RNAi, cells were treated two times (on day 1 and 4 after seeding) with 50 nM siGENOME Control siRNA RISC-free small interfering RNA (siRNA; D-001220-01-05; Dharmacon, Lafayette, CO) or VPS53 ON-TARGET plus siRNA (J-017048–08) using Oligofectamine (Invitrogen, Carlsbad, CA) according to the manufacturer's protocol. On day 6, cells were treated overnight with 1 µM myriocin or dimethyl sulfoxide (DMSO) as indicated in serum-free medium and fixed in 4% paraformaldehyde (PFA) for filipin staining or immunofluorescence. PCCA2 were described previously (Feinstein et al., 2014). PCCA2 patient and control fibroblasts were cultured in Dulbecco's Modified Eagle Medium (DMEM) supplemented with 10% FBS and 1% PenStrep. Three independent human fibroblast lines were used as wild-type controls following genomic DNA sequence analysis to ensure the absence of PCCA2 mutations in VPS53. After reaching 80% confluence (day 3 after seeding), cells were treated with 1 µM myriocin or mock treated for 72 hr, lysed, and processed for lipidomics. Human fibroblasts were treated longer than HeLa cells to compensate for their slower growth and metabolism. The yeast deletion collection (Winzeler et al., 1999) and the yeast DAMP-collection (Breslow et al., 2008) were spotted in triplicates on SC complete plates containing 1 µM myriocin or methanol and incubated for 48 hr at 30°C. Pictures were taken with a Nikon D60 camera (Nikon, Japan) in a light box. The colony size was then measured with the program colony grid analyzer (http://sourceforge.net/projects/ht-col-measurer). The T-score was calculated as described before (Collins et al., 2006). The analysis and plots were done with the open source software package R (http://www.r-project.org/). Data sets for the analysis of E-MAP data were derived from (Hoppins et al., 2011). For SILAC labeling, lysine auxotroph strains were grown in yeast nitrogen base (YNB) medium containing either 30 mg/l L-lysine or 30 mg/l L-lysine-U-(Montefusco et al., 2014)C6,15N2. 25 optical density (OD) units of light and heavy-labeled cells were mixed and lysed in 200 µl buffer containing 50 mM Tris Cl pH = 9.0, 5% sodium dodecyl sulfate (SDS), and 100 mM dithiothreitol (DTT) for 30 min at 55°C. Lysates were cleared by centrifugation at 17000 g for 10 min and supernatants were diluted with buffer (8 M urea, 0.1 M Tris Cl pH = 8.5) to a final concentration of 0.5% SDS. Proteins were digested with the endoproteinase LysC following the protocol for filter-aided sample preparation, (Wisniewski et al., 2009) as described previously(Frohlich et al., 2013). Peptides were separated by reversed phase chromatography using 50-cm columns as described previously (Frohlich et al., 2013). Mass spectrometry and data analysis were performed as described previously (Frohlich et al., 2013). Yeast lipids were analyzed as described previously (Ejsing et al., 2009; Klose et al., 2012; Olson et al., 2015). For LC-MS/MS analysis, sphingolipids were extracted from yeast according to 7.5 μg of protein by dichloromethane/methanol extraction (Sullards et al., 2011). The levels of PHS and DHS were determined as described previously (Muir et al., 2014). Mammalian sphingolipids were analyzed as described previously (Bird et al., 2011bib6). For LC-MS/MS analysis, sphingolipids were extracted from HeLa cells according to 7.5 μg of protein by dichloromethane/methanol extraction (Sullards et al., 2011). Mammalian sphingolipids peaks were identified using the Lipid Search algorithm (MKI, Tokyo, Japan). Peaks were defined through raw files, product ion, and precursor ion accurate masses. Candidate sphingolipids and sphingolipid intermediates were identified by database (>1,000,000 entries) search of positive ion adducts. The accurate mass extracted ion chromatograms were integrated for each identified lipid precursor and peak areas obtained for quantitation. Internal standards for each lipid class (LCB 17:0;2; Cer 18:1;2/17:0;0; HexCer 18:1;2/12:0;0; SM 18:1;2/17:0;0) spiked in prior to extraction were used for normalization and calculation of the amounts of lipids in pmol/μg protein. For fluorescence microscopy, yeast cells were grown to OD = 0.6 in synthetic medium at 30°C unless otherwise indicated. Cells were mounted in synthetic media onto coverslips previously coated with concanavalin A and imaged with a spinning-disk confocal microscope (TiLL iMIC CSU22; Andor, Northern Ireland) using a back-illuminated EM charge-coupled device camera (iXonEM 897; Andor) and a 100 × 1.4 NA oil immersion objective (Olympus, Japan). 16-bit images were collected using Image iQ (version 1.9; Andor). Images were filtered with a smoothening filter averaging 2 pixels, converted to 8-bit images, and cropped using ImageJ software (http://rsbweb.nih.gov/ij/). Yeast cells from cultures grown to OD600 ≈ 0.5 were fixed with 4% PFA for 10 min and washed three times with H2O. Cells were incubated in the presence of 0.1 mg/ml filipin for 15 min in the dark at constant shaking and directly mounted on concanavalin coated coverslips. Images were taken on a Nikon epifluorescence microscope equipped with a Nikon Intensilight C-HGFIE fiber illuminator. HeLa cells were fixed for 30 min in 4% PFA in phosphate buffered saline (PBS) and washed 3 times with PBS. Filipin (50 mg/ml) was diluted 1:250 in PBS, and cells were incubated for 30 min at room temperature in the dark, washed 3 × 5 min, and imaged directly in 6-well glass bottom plates (MatTek, Ashalnd, MA, United States). Images were collected on a DeltaVision workstation (Applied Precision, Issaquah, WA, United States) based on an inverted microscope (IX-70; Olympus) using a 100 × 1.4 NA oil immersion lens. Images were captured at 24°C with a 12-bit charge-coupled device camera (CoolSnap HQ; Photometrics, Tucson, AZ, United States) and deconvolved using an iterative-constrained algorithm and the measured point spread function (Chi et al., 2014). Stock solutions of 1 mg/ml FM4-64 and 0.5 mg/ml NBD-sphingosine were prepared in DMSO. 1 OD unit of exponentially growing yeast cells were harvested by centrifugation. Cells were stained in 50 μl YPD (yeast extract peptone dextrose) medium containing 20 μg/ml FM4-64 and 10 μg/ml NBD-sphingosine for 15 min at 30°C shaking in the dark. Cells were washed 3 times with 1 ml YPD medium and incubated in 1 ml YPD for 45 min, shaking in the dark at 30°C. Cells were pelleted, resuspended in 50 μl YPD, and mounted on concavalin A coated coverslips. For immunofluorescence experiments, HeLa cells were grown in 6-well glass bottom plates (MatTek) and fixed with 4% PFA/0.1 M sodium phosphate buffer pH = 7.2. Blocking and primary and secondary antibody staining were performed using 3% bovine serum albumin in PBS +0.1% Triton X-100. The primary antibodies used in this study were as follows: mouse anti-GFP antibody (Roche Life Science, Switzerland), mouse anti-HA antibody (Roche Life Science), mouse anti-PGK1 monoclonal antibody (Abcam, United Kingdom), rabbit anti-LAMP1 antibody (Cell Signaling Technology, Danvers, MA, United States), rabbit anti-Vps53 antibody (Atlas Antibodies, Sweden), and mouse anti-tubulin antibodies (Sigma, St. Louis, MO, United States). Secondary antibodies used for immunofluorescence were HRP-conjugated (horseradish peroxidase) anti-mouse and anti-rabbit IgG (Santa Cruz Biotechnology, Dallas, TX, United States) and Alexa 488–conjugated anti-rabbit IgG (Invitrogen/Thermo, Waltham, MA, United States). High-pressure freezing and electron microscopy were performed as described previously (Wilfling and et al., 2013). Molecular Biology of the Cell 20:1565–1575. Proceedings of the National Academy of Sciences of USA 96:11041–11048. The Journal of Clinical Investigation 109:1541–1550. Molecular Biology of the Cell 11:2429–2443. Molecular Biology of the Cell 11:305–323. Proceedings of the National Academy of Sciences of USA 106:2136–2141. The Journal of Cell Biology 180:473–482. Journal of Medical Genetics 51:303–308. The Journal of Cell Biology 185:1227–1242. Molecular & Cellular Proteomics 12:1995–2005. The Journal of Cell Biology 183:1075–1088. Proceedings of the National Academy of Sciences of USA 107:5851–5856. The Journal of Steroid Biochemistry and Molecular Biology 129:70–78. The Journal of Cell Biology 185:601–612. Biochimica et Biophysica Acta 1801:1330–1340. Proceedings of the National Academy of Sciences of USA 97:7957–7962. Biochimica et Biophysica Acta 1771:271–285. Biochemical and Biophysical Research Communications 211:396–403. Chemistry and Physics of Lipids 177:26–40. Molecular Genetics and Genomics 288:207–229. The Journal of Biological Chemistry 272:9809–9817. The Journal of Biological Chemistry 290:4238–4247. Molecular Biology of the Cell 19:2350–2362. Molecular Biology of the Cell 21:3386–3395. Proceedings of the National Academy of Sciences of USA 107:12860–12865. Proceedings of the National Academy of Sciences of USA 108:19222–19227. Annual Review of Biophysics and Biomolecular Structure 33:269–295. Biochimica et Biophysica Acta 1811:838–853. Proceedings of the National Academy of Sciences of USA 104:20890–20895. Nature Reviews Molecular Cell Biology 9:112–124. Journal of Cell Science 115:2627–2637. The Journal of Biological Chemistry 268:13830–13837. The Journal of Biological Chemistry 270:13171–13178. American Journal of Human Genetics 89:168–175. Thank you for submitting your work entitled “The GARP Complex Is Required for Cellular Sphingolipid Homeostasis” for peer review at eLife. Your submission has been favorably evaluated by Vivek Malhotra (Senior Editor) and three reviewers, one of whom, Peter Tontonoz, is a member of our Board of Reviewing Editors. One of three reviewers, Suzanne Pfeffer, has agreed to share her identity. This very interesting paper shows that GARP-complex mediated retrograde transport is needed for sphingolipid homeostasis in both yeast and human cells. The authors use genome wide proteomics and lipidomics to show that loss of GARP leads to the accumulation of long chain base sphingolipid synthesis intermediates that may trigger toxicity by release of zinc from the vacuole. Ergosterol esters also increased, as did lipid droplets. Finally, a disease causing allele showed similar defects. These data reveal a surprising result: inhibition of the first step in sphingomyelin synthesis may be able to suppress neurological defects in the GARP complex. The reviewers were in agreement that the work was of high quality and would be of interest to the eLife audience. All of the reviewers believed that implicating the GARP complex in sphingolipid homeostasis was an important advance. A few straightforward issues should be addressed. 1) Does mutation of another GARP subunit show the same effect? E.g., VPS54 mutation leads to an ALS-like phenotype in mice. Could the authors analyze sphingolipid content and myriocin-response of VPS54 mutant cells? This would clarify whether the phenotype is a unique feature of one subunit or an entire pathway that is involved. 2) The authors stress the therapeutic implications, but the relevance of myriocin treatment for neurological disease is not yet clear, as these studies were performed in yeast and knockdown HeLa cells. The impact could be improved with a better PCCA2 model. At a minimum, analysis of the human vps53Q624R mutation should be performed in a human cell line. 3) In Figure 4A, it is important to show whether myriocin can rescue the sterol mislocalization as in Figure 6A, because this would indicate that the primary defect is with sphingolipids. Conversely, does simvastatin also partially rescue the GARP mutant sphingolipid phenotype? 4) Why do the authors think that no Ypt proteins or Imh1 showed up in the screen? Are there any GARP interactors? Please comment more on the breadth of hits beyond Figure 1—figure supplement 1. 5) The authors have not yet provided an explanation for the mis-localization of sphingolipids and the 8-fold increase in LCBs. GARP complex mediates membrane tethering, and it is not clear whether the changes in sphingolipids result directly from a retrograde trafficking defect. Do sphingolipids recycle through the retrograde vesicles controlled by retromer/GARP? Is it possible that GARP malfunction causes mislocalization of key lipid sorting proteins, which then causes mislocalization of sphingolipids? While experiments to address these questions may be beyond the scope of the present study, additional discussion of these issues could be included. We agree that is important to show that the different subunits of the GARP complex have similar phenotypes. We have now added the subunits Vps52 and Vps54 to our yeast analyses and added the data to Figure 2 and modified the text accordingly. The referees raise an important point. We have now obtained fibroblasts from PCCA2 patients (published earlier in Feinstein et al., J. Med. Genetics, 2014). Importantly, we observe an accumulation of early sphingolipid intermediates in these cells compared with controls. Similar findings were obtained previously in HeLa cells, where, not unexpectedly, the overall sphingolipid composition is somewhat different from skin fibroblasts. We have added these data to Figure 6 and modified the text accordingly. We thank the reviewers for raising two interesting points. Concerning the first point, we have now analyzed sterol accumulation in vps53 and vps54 mutants in response to myriocin. Indeed, sphingolipid depletion is sufficient to rescue the observed accumulation of filipin-positive structures. Interestingly, myriocin treatment in wildtype cells has the opposite effect, resulting in the accumulation of filipin-positive structures. Similar effects have been observed in a mutant carrying a temperature sensitive allele of the serine palmitoyl transferase, lcb1-100 (Baumann et al., Biochemistry, 2005). While the underlying mechanisms for this redistribution are not clear, the authors speculate that depletion of sphingolipids affects the plasma membrane ratios of sphingolipids and sterols resulting in more “free” sterols not in complex with sphingolipids, and that these “free” sterols redistribute to intracellular compartments. In line with this model, we also observe lower levels of complex sphingolipids in GARP mutants. We have added the data to Figure 3 and modified the text and Discussion accordingly. We also agree that analysis of sphingolipids in GARP mutants treated with sterol-synthesis inhibitors would be very interesting. Unfortunately, this has proved to be very difficult due to technical reasons: growth of GARP mutants is very sensitive to inhibition of sterol biosynthesis (e.g., shown by the synthetic lethality of vps52∆erg3∆, Figure 4—figure supplement 1). Therefore we were not able to achieve treatment conditions of GARP mutants with simvastatin allowing for lipid analysis. Thank you for raising this important point on GARP biology. Generally, we have set up our screen with stringent selection and significance criteria. Thus, it is possible that mutants with relatively smaller effects will be false negatives. We have edited the text to better describe the screen and its results. The GARP complex is known to cooperate with the SNARE proteins Tlg1, Tlg2 and Vti1. Both TLG2 and Vti1DAMP are also strong suppressors of the growth defect caused by sphingolipid inhibition. TLG1DAMP does not give a significant phenotype, which might be explained by the nature of the DAMP allele, which destabilize the mRNA of a gene (thus might not make the protein rate limiting). YPT6 is not a significant outlier in our screen but the 98% overlapping ORF VPS63 is significantly suppressing the growth defect caused by myriocin. Possibly this could hint to a problem in the ypt6Δ strain in the collection. Consistent with a role for Ypt6 in maintaining lipid homeostasis, one of the two subunits of the Ypt6 nucleotide exchange factor, Ric1, is significantly more resistant to myriocin treatment. For Imh1, we observe no defect. Thus, Imh1 could either be dispensable for GARP function in lipid homeostasis or it could be a false negative in our genetic screen. We thank the reviewers for pinpointing an important mechanistic question. Unfortunately, there are few good tools to study the trafficking routes of lipids in cells. Thus, the best evidence for sphingolipid accumulation due to mis-sorting of the lipids, rather than an enzyme in the biosynthetic pathway, is indirect: i) the enzymes of LCB synthesis are ER localized and we do not observe changes for their abundance or localization; ii) since long chain base levels decrease slowly after myriocin treatment in GARP mutants, we believe that sphingolipids are increasingly trafficked to vacuoles for degradation. If the alternative model was true, and the LCB increase in GARP mutants would result solemnly from de novo biosynthesis, long chain base levels should be depleted faster as SPT inhibition is near instantaneous. However, at this time, we cannot rule out that proteins important for sphingolipid synthesis and/or handling are miss-sorted in GARP mutants. We consider it an interesting model that a protein important for the transport of long chain bases out of vacuoles is not reaching its destination and therefore contributes to the observed phenotype. We have edited the Discussion to better reflect these important points. We would like to thank Drs. Christopher Burd, Richard Chi, Karin Reinisch, and members of the Farese/Walther laboratory for critical discussion and comments on the manuscript. We thank Drs Ohad Birk, Juan Bonifacino, and Taroh Kinsohita for providing us with crucial reagents. We thank Dr. Michelle Pflumm for expert assistance with manuscript preparation. We are grateful to Dr. Ole N Jensen for access to the Triversa NanoMate. This work was supported by NIGMS grant R01GM095982 (to TCW), the G Harold and Leila Y Mathers Foundation (to TCW), the Consortium for Frontotemporal Dementia Research (to RVF), and by Lundbeckfonden (R54-A5858, to CSE) and Villum Fonden (VKR023439 to CSE). © 2015, Fröhlich et al. Proteins and lipids of the plasma membrane underlie constant remodeling via a combination of the secretory- and the endocytic pathway. In the yeast endocytic pathway, cargo is sorted for recycling to the plasma membrane or degradation in vacuoles. Previously we have shown a role for the GARP complex in sphingolipid sorting and homeostasis (Fröhlich et al. 2015). However, the majority of cargo sorted in a GARP dependent process remain largely unknown. Here we use auxin induced degradation of GARP combined with mass spectrometry based vacuolar proteomics and lipidomics to show that recycling of two specific groups of proteins, the amino-phospholipid flippases and cell wall synthesis proteins depends on a functional GARP complex. Our results suggest that mis-sorting of flippases and remodeling of the lipid composition are the first occurring defects in GARP mutants. Our assay can be adapted to systematically map cargo of the entire endocytic pathway.